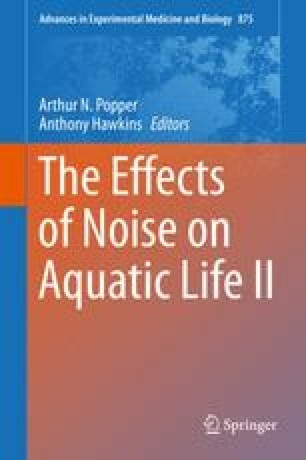 Anthropogenic noise can be detrimental to aquatic life through physical harm and behavioral impact. Physical harm to fish only occurs very close to typically brief but high-power sources. Behavioral impact occurs at more moderate levels and is spatially and temporally much more widespread. More studies are needed to get a better understanding of the behavioral impact on fish. Indoor and outdoor studies vary in their acoustic and behavioral validity and in the amount of experimental control. Although each approach has its limitations, scientific progress and applied insights will depend on the exploitation of their complementary potential. I thank Art Popper and Tony Hawkins for the organization of the excellent meeting in Budapest and for providing opportunity and feedback. I am also grateful to Peter Rogers and David Zeddies for very clear and useful presentations at the meeting and valuable interactions afterward. Furthermore, I thank my collaborators in Leiden, IJmuiden, and Den Haag who have contributed to my current understanding of the topic: Errol Neo, Saeed Shafiei Sabet, Özkan Sertlek, Carel ten Cate, Erwin Winter, Loes Bolle, and Michael Ainslie. My work was funded by the Netherlands Organization for Scientific Research (NWO-ZKO).